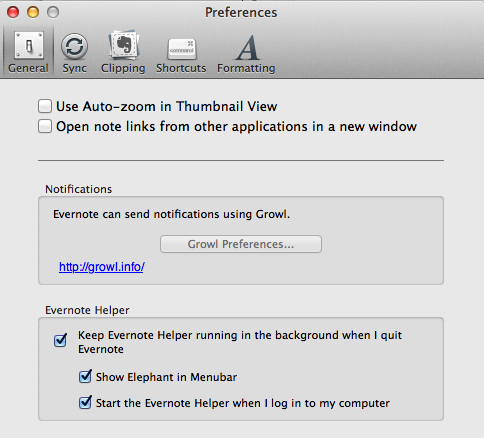 For some reason I have two "elephant" icons from Evernote at the top right menu bar. Does anyone know if this is a bug in Evernote or how to remove the extra one? After installing from the Mac App Store two elephant icons will appear on the menubar. Then I deleted the EvernoteHelper (select and press the "-" button). Sounds weird. Have you tried to relaunch Finder? Apple->Force Quit->Finder and click relaunch. Then under general uncheck "Start the Evernote Helper when I log in to my computer"
Not the answer you're looking for? Browse other questions tagged evernote mac or ask your own question. OS X Lion Install DVD - Upgrade Install? How do I clear the update ready status for a Mac app store update I don't want? How to use Windows to create a bootable Mac OS X 10.10 (Yosemite) USB flash drive? How can I remove Category And Search bar in Evernote?